The Kyllene Harbour Project was initiated in 2007, and the survey has been continued in 2008 and 2009. It is an interdisciplinary study of the coastal and underwater remains of an ancient naval base and Frankish harbour, and it is conducted as a synergasia between the Ephorate of Underwater Antiquities and the Finnish Institute at Athens with the co-operation of the Sixth Ephorate of Byzantine Antiquities at Patras. The persons responsible for the project are Dr Jari Pakkanen on behalf of the Finnish Institute and Mr Dionysios Evangelistis, representative of the Ephorate of Underwater Antiquities. The representative of the Sixth Byzantine Ephoria is Dr Demetrios Athanasoulis. The harbour of Kyllene is located in the north-western part of the Peloponnese. Modern Kyllene is best known as a port for the ferries to Kephallonia and Zakynthos, and since the new harbour of Kyllene is only 800 m east of the earlier one, the busy shipping route passes relatively close to the ancient and medieval remains. The port had an important geostrategic location and a tactical role in warfare and trade in Western Greece both in classical antiquity and the medieval times. Despite the constant hammering of waves, the partially submerged principal harbour installations – moles, quays, breakwaters and towers – are in a relatively good state of preservation. Regardless of their condition they have not yet been properly studied or archaeologically recorded until now, and this is at least partially due to the fact that the focus of harbour archaeology in Greece has nearly exclusively been on ports of classical antiquity. In the project we have combined the archaeological, topographical and historical studies of the harbour with maritime geomorphological research. The work has been conducted with the permission of the Hellenic Ministry of Culture. The research in 2007 and 2008 was funded by the I. F. Kostopoulos Foundation, and the interest and support shown by the mayor and municipality of Kastro-Kyllini in the research all through the years has been extensive. The funding for 2009 was from the Finnish Institute and Emil Aaltonen and Ella and Georg Ehrnrooth foundations, and the field season in 2010 has received funding from the Finnish Cultural Foundation and the Finnish Institute at Athens. In classical antiquity Kyllene was the principal outport of ancient Elis, so a large part of the participants and spectators arriving to the Olympian games by sea would have landed there. Thucydides (2.86.1, 3.69.1–2) reports that during the Peloponnesian War (431–404 BC) it was the major Spartan naval base against the Athenian naval forces in western Greece. In the Hellenistic period, the harbour remained of key strategic importance for the war fleets of the Ptolemies and the Macedonians. The medieval fortifications and harbour installations are in many places built of re-used ancient blocks and Hellenistic and Roman pottery and coins have been documented in medieval strata. At the end of the Fourth Crusade, after the fall of Constantinople, western Peloponnese (Morea) was conquered in AD 1205 by the Franks who held it for more than two centuries as the Principality of Achaia. The Villehardouins developed the coastal city of Kyllene (then known as Glarenza) as a significant strategic post and they also fortified the settlement. Due to its ideal location between mainland Greece and Italy, the city-harbour emerged rapidly as one of the most famous international centres of medieval Europe: ships from Venice and Genoa transited goods from all of Frankish Greece to Western Europe. The harbour flourished for two centuries, but in the early fifteenth century its fortunes were reversed: between 1407 and 1428 it changed hands five times and in 1431 the Byzantine Konstantinos Palaiologos destroyed its walls to prevent a new capture of the city and the harbour. Total stations are used in all topographical work and architectural recording, including mapping of the coastal and archaeological features in the sea. Most of the walls and structures are in shallow water and they are relatively easy to record using a total station and prism pole of varying heights. In 2009 the project used three total station teams simultaneously. In conditions of low visibility because of surface ripples or floating sand in the sea it is necessary to increase the size of the prism team to two persons: the snorkeler is then responsible for correct positioning of the prism tip and calling what the target is. Since the architectural blocks of the Greek tower being measured here are very well preserved and therefore require even more detailed recording than usual, the measurements were invariably assisted by a snorkeler. For points deeper than at 4m it is necessary to use divers: two divers are at the sea bottom and together with the snorkeler on the surface make sure that the prism pole is vertical. A second snorkeler then communicates on a radiophone with the person the total station when it is possible to move to the next point. Thus far an area of ca 650 × 200m has been surveyed and more than 30,000 topographical points have been taken; most of the recorded points are under water, and equal emphasis has been given to mapping the topographical and archaeological features of the study area. The image shows a small part of the survey area. The material of the recorded object is coded together with its co-ordinates on the total station; architectural structures and details are directly recorded as lines in order to simplify further handling of the data. The data recorded during the day is without exception processed the same evening, and we have found this process very useful for the design and execution of the work the following day. Most days nearly a thousand points were taken on each total station and sometimes clearly more, so processing of the data has been computerised as far as possible: the coded lines and materials are directly transformed into an AutoCAD dxf-file. The data is appended to the previous files and new plans are printed for the measurement teams; if printouts are needed for underwater work, they are also laminated. The daily data is also integrated into a preliminary three-dimensional model using the GIS program ArcScene in order to check whether more precise measurements are needed for computer modelling. The aim of the survey is to directly record all the architectural features in 3D in sufficient detail so that they can be published at the scale of 1:100 with minimal processing in GIS and CAD. The plan also shows what perhaps could be described as the main discovery of the first two seasons: verification of Greek harbour structures below the Frankish ones. It is a more detailed preliminary plan of the structures at the east end of the study area: the darker areas are parts of the structures currently above sea level, and it shows the sections recorded in 2008. W1 is a typical Frankish wall built in mixed technique employing reused ashlar blocks and rubble set in mortar. Structure S1a is a Greek platform built of ashlar blocks and protected from the waves by the Frankish structure S1b partially built on top of it. S1a is a clear indication of the rise in relative sea levels from antiquity to present day: the surfaces currently 0.6m below sea level have cuttings for iron dowels set in lead, so the blocks must have been out of the water in antiquity. Further recording of S1a was carried out in 2009: the size of the foundations of the tower can now be established as approximately 10 m by 10 m.
A new methodological approach for using magnetometer in very shallow waters was tested by the Patras team. Magnetometer has been successfully employed at Caesarea Maritima in Israel, but as far as we are aware it is the first time it has been employed for harbour studies in Greece. The aim of the research is to study the geomorphological features of the ancient and medieval harbour by using non-destructive remote sensing methods. It is too early to give a full account of our research, but some general observations of the Frankish harbour can be put forward. The slide presents a preliminary plan of the principal study area in 2007–2009 with a digital elevation model of the mapped features in the background (W = wall; S = structure; Z = zone). The harbour entrance from the north-east is rather clear and it is possible that the mouth was blocked by destroying the towers on the both sides of the entrance: this would also match the literary descriptions of the destruction of the installations in 1431. Further studies integrating the results of the topographical and geophysical surveys are needed to clarify whether it was also possible to enter the Frankish harbour basin from the north and west. A more detailed interpretation of the recorded structures is currently being carried out by the research team. The data collected in the maritime geomorphological study has revealed the spatial distribution of the submerged harbour remains and the seafloor morphology related to the different port installations. Furthermore, targets of potential archaeological interest have been discovered. 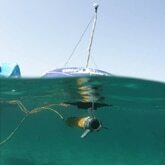 Finally, the study has demonstrated that the use of remote sensing techniques in conjunction with detailed archaeological and topographical survey in shallow-water coastal sites could be an effective methodological approach for the study of submerged ancient ports and coastal installations in the eastern Mediterranean. J. Pakkanen, ‘Kyllini Harbour Project’, in C. Morgan, ‘Archaeology in Greece 2007-2008’, Archaeological Reports 54 (2007–2008) p. 42-43. J. Pakkanen, ‘Kyllini Harbour Project’, in C. Morgan, ‘Archaeology in Greece 2008-2009’, Archaeological Reports 55 (2008–2009) p. 38-39. J. Pakkanen, ‘Underwater investigations of the ancient and medieval harbour at Kyllene’, Annual lecture of the Finnish Institute at Athens, 14 May 2009. J. Pakkanen, ‘Underwater archaeological, architectural and topographical research project of the ancient and medieval harbour at Kyllene-Glarentza’, lecture in Finnish in the series Fieldwork in the Mediterranean: bureaucracy and practice, Department of Classical Philology, University of Helsinki, 17 November 2009.